In November 1948, Henry and Edgar Kaiser secured a $44 million loan from the RFC to support sales operations and new model development, $12 million of which was to be used for the development of a new compact economy car. The Kaisers later obtained an additional $25 million loan to cover inventory costs for 1949 and 1950. Frazer’s gloomy predictions for 1949 proved to be correct. 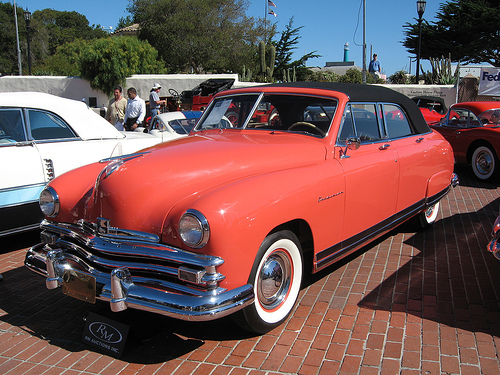 Despite the addition of the new convertibles, the trend-setting Kaiser Virginian hardtop, and a novel new hatchback model (called Traveler or Vagabond, depending on trim), Kaiser and Frazer sales were less than half the previous year’s, leaving some 20,000 unsold leftover ’49s that had to be re-registered as 1950 models. That left the company with an after-tax loss of $30.3 million, followed by an additional $13.3 million loss for fiscal 1950. Once Joe Frazer was gone, the Frazer marque was not long for the world. 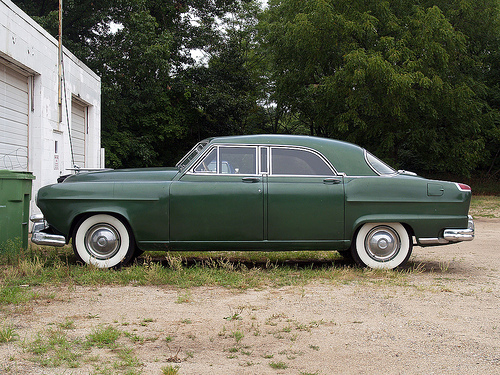 Although Kaiser-Frazer advertising still proclaimed the Frazer “the Pride of Willow Run,” the 10,000-odd 1951 Frazers were actually leftover 1950 models fitted with the restyled front clip originally intended for the 1950 facelift. The only reason those cars were offered at all was to use up some $7 million in existing Frazer trim and upholstery. Henry Kaiser often said that he valued employees and partners who were willing to challenge his thinking, so it’s ironic that he broke ties with Joe Frazer primarily because Frazer refused to tell the old man what he wanted to hear. To Henry Kaiser, Frazer’s caution smacked of defeatism, something for which Kaiser had little patience. In a later interview with Richard Langworth, Hickman Price (not necessarily a neutral observer) expressed the belief that the Kaisers had always considered their partnership with Frazer to be a temporary expedient. We don’t know if that was true — such an attitude seems out of character for Henry Kaiser, who was nothing if not an optimist — but considering Kaiser and Frazer’s fundamental differences, it was probably inevitable that the two would part ways sooner or later. The split with Frazer and the disaster of 1949 and 1950 left Kaiser-Frazer bloodied, but still unbowed. The company’s new models were nearly ready and the Kaisers girded themselves to try again in 1951, as we’ll see in part two. Our sources for this article included Stephen B. Adams, Mr. Kaiser Goes to Washington: The Rise of a Government Entrepreneur (Chapel Hill, NC: University of North Carolina Press, 1997); the Auto Editors of Consumer Guide, Cars That Never Were: The Prototypes (Skokie, IL: Publications International, 1981), and Encyclopedia of American Cars: Over 65 Years of Automotive History (Lincolnwood, IL: Publications International, 1996); Douglas Brinkley, Wheels for the World: Henry Ford, His Company, and a Century of Progress (New York: Viking Penguin, 2003); Arch Brown, “1953 Allstate: Henry J in Drag?” Special Interest Autos #155 (September-October 1996), reprinted in The Hemmings Book of Postwar American Independents: driveReports from Special Interest Autos magazine, ed. Richard A. Lentinello (Bennington, VT: Hemmings Motor News, 2002), pp. 4-11; “Controls: Strength through Pain,” TIME 18 December 1950 (www.time. com, accessed 3 June 2010); Howard “Dutch” Darrin, “My American Safari: Further Adventures in the Automotive Jungle,” Automobile Quarterly Vol. 10, No. 1 (First Quarter 1972), pp. 36-45; Mark S. Foster, Henry J. Kaiser: Builder in the Modern American West (Austin, TX: University of Texas Press, 1989); Patrick R. Foster, The Story of Jeep (Iola, WI: Krause Publications, 1998); Roberto Dario Frassinetti, “Rare car Bergantin made by Kaiser Frazer of Argentina (14 February 2006, Route 40 for the Adventure Traveller by Bob Frassinetti, route40argentina.tripod. com, accessed 16 December 2009); Nick Georgano and Nicky Wright, Art of the American Automobile: The Greatest Stylists and Their Work (New York: SMITHMARK Publishers, 1995); Ken Gross, “Pride of Willow Run: 1951 Frazer Manhattan Convertible” and “Then Man Who Never Failed,” Special Interest Autos #27 (March-April 1975), reprinted in The Hemmings Book of Postwar American Independents: driveReports from Special Interest Autos magazine, pp. 28-35; John Gunnell, ed., Standard Catalog of American Cars 1946-1975, Rev. 4th ed. (Iola, WI: Krause Publications, 2002); David Halberstam, The Fifties (New York: Ballantine Books, 1993), and The Reckoning (New York: William Morrow and Company, 1986); Ronald Hansen, Emilio R. del Valle, and Enrique T. Meincke, “IKA Torino 380 W,” Parabrisas No. 80 (August 1967), Test del Ayer, www.testdelayer. com.ar/ torino380.htm, n.d., last accessed 9 April 2015; “Henry J vs. Maverick: How much progress in 23 years?” Special Interest Autos #23 (July-August 1974), reprinted in The Hemmings Book of Postwar American Independents, pp. 36-41; “High Finance: From Riches to Riches,” TIME 30 April 1945, (www.time. com, accessed 17 December 2009); Dave Holls and Michael Lamm, A Century of Automotive Style: 100 Years of American Car Design (Stockton, CA: Lamm-Morada Publishing Co. Inc., 1997); Michael Lamm, “The Imagineer William B. Stout: Automobile and Airplane, His Goal Was to See Them Wedded,” Car Life Vol. 14, No. 7 (August 1967): 54–58; L’Editrice Dell’Automobile LEA, World Cars 1973 (Bronxville, NY: Herald Books, 1973) and World Cars 1979 (Pelham, New York: Herald Books, 1979); David L. Lewis, “Ford’s Postwar Light Car,” Special Interest Autos #13 (October-November 1972): 22–27, 57; Tom McCahill, “MI Test the 1951 Kaiser Special,” Mechanix Illustrated May 1950, pp. 84–85, 160, 174; Jack Mueller, ed., KFOCI Handbook, v. 4.0 (Kaiser-Frazer Owners Club International: n.d.), circlekf. com, last accessed 27 June 2011; Richard Langworth, “1953 Kaiser Manhattan: SIA Drives a NOS Kaiser,” Special Interest Autos #94 (July-August 1986), all of which are reprinted in Richard A. Lentinello, ed., The Hemmings Book of Postwar American Independents: driveReports from Special Interest Autos magazine (Bennington, VT: Hemmings Motor News, 2002), pp. 46-61; and Kaiser-Frazer, the Last Onslaught on Detroit: An Intimate Behind the Scenes Study of the Postwar American Car Industry (Automobile Quarterly Library Series) (Boston, MA: E.P. Dutton, 1975); Michael Parris, Fords of the Fifties (Tucson, AZ: California Bill’s Automotive Handbooks, 2000); “State of Business: Step This Way, Please!” TIME 19 May 1952 (www.time.com, accessed 3 June 2010); Daniel Strohl, “Companies that used Continental engines – the complete list,” (10 December 2008, Hemmings Blog, blog.hemmings. com, accessed 17 December 2009), and “Rambling Men,” Hemmings Classic Car #57 (June 2009); Mark Theobald, “Howard A. ‘Dutch’ Darrin 1897-1982” (2004, Coachbuilt, www.coachbuilt. com, accessed 25 June 2011); and Henry Kaiser’s obituary, “The Man Who Always Hurried,” TIME 1 September 1967 (www.time. com, retrieved 17 December 2009). Additional background information on Henry and Alyce Kaiser came from Joan Didion’s 1966 essay “Letter from Paradise, 21° 19′ N., 157° 52′ W,” originally published in Didion’s anthology Slouching Toward Bethlehem (New York: Farrar, Straus and Giroux, 1968) and reprinted in We Tell Ourselves Stories in Order to Live: The Collected Nonfiction (New York, Alfred A. Knopf, 2006), pp. 142-153; “Henry Kaiser Tells Plan to Wed Nurse,” The Deseret News 7 April 1951, p. 2; “Kaiser Takes Bride Today,” Miami Sun News 10 April 1951, p. 15; School of Travel Industry Management, 2007 Legacy Honorees, “Henry J. Kaiser,” (28 November 2007, www.tim.hawaii. edu, accessed 25 June 2011; “TYCOONS: Henry J.’s Pink Hawaii,” TIME 24 October 1960, www.time. com, accessed 25 June 2011; and the Wikipedia® entry for Kaiser Permanente (en.wikipedia.org/wiki/Kaiser_Permanente, accessed 26 June 2011). Some additional information on the Willow Run plant also came from “Production Miracle at Willow Run,” Strategos International, www.strategosinc. com/ willow_run.htm, accessed 18 December 2009, and Joe Baugher, “The Liberator Production Pool,” American Military Aircraft, 8 August 1999, home.att. net/ ~jbaugher2/b24_8.html, accessed 18 December 2009. For the record, we’re not 100% certain that Henry Kaiser ever actually said, “The Kaisers never retrench!” — it was Joseph Frazer who related that oft-quoted exclamation in his conversations with Richard Langworth for Langworth’s remarkable and long out-of-print book Kaiser-Frazer, the Last Onslaught on Detroit. The Kaisers declined to be interviewed for Langworth’s book, so we have only Frazer’s word for it, but we grant that it certainly sounds like something Henry Kaiser would say! “Scalpers” as you call them is an understatement. A big three dealer would rip you off for almost double asking price after the war. My father returning in 1947 bought a K-F Manhattan only because he could get it at ’sticker’ price. He kept it for a few years but do not remember him saying anything wonderful about that car. He always had bad judgment when it came to car buying and eventually even bought a Henry J. But will save that story for another time too. A couple of minor points: first, George Washington had no children (only step-children, who did not carry the Washington name) so Mrs. Frazer must have been descended from a relative of the President’s. Second, the caption under the ad for the 1949 Virginian has both wheelbases identified as Kaiser, rather than one Kaiser and one Frazer. Thanks for catching that glitch, and for the clarification. Joe Frazer’s mother was part of the same family as George Washington, but obviously not a lineal descendant; I’m a little hazy on the precise genealogy, but I think she was descended from one of Washington’s brothers. The first car of my family’s that I have clear memories of was a ’49 Frazer. (I have dim memories of a Crosley station wagon.) My father had gotten it used in 1950. Knowing him, he would have bought a car on thoroughly hard-nosed, pragmatic criteria, but I don’t know how that led to this particular car. In 1956 he got tired of chasing wrecking yard parts and got a ’53 Pontiac. I would assume that when he bought the Frazer, he gave the marque too much credit for long-term viability. You obviously havent seen one in person they are amazing cars and pioneered many things like the drop out power train where you could drop the motor and Trans by a couple of bolts on the bottom and drip them out. And they are great cars and they had the first car to get 30 miles per gallon, and the kaiser Darrin was the first all fiberglass car beating the corvette by a month. Interested to know more about Jean-Albert Gregoire’s involvement with Kaiser-Frazer though have little information to go on aside from Kaiser-Frazer investigating FWD and considering to build under license either the AFG (that later evolved into the Panhard Dyna X) or a version of the Hotchkiss-Gregoire as a 1946 Kaiser. for a Studebaker car and pickup truck. Next came a 1955 Packard. Everybody noticed my Mother in her Packard. She hated that. By by Packard and helo 1956 Buick Roadmaster. In the GM camp we then stayed.